Over 2,500 references to the published books & works on the art and craft of the locksmithing world. advising quantity required and your location, - UK, EU or Global. Ask about our invoicing options. With additional input by T Beck & A Carter. Second edition 2013, 427 pages, 210 x 297mm. Card covers, perfect binding. 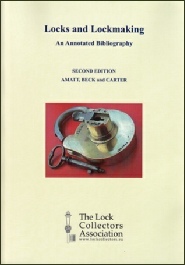 Privately published by The Lock Collectors Association.